and head out for the ocean. Music from the Fantastic Shakers ladies and gentlemen!! …and if you don’t take their advice there are plenty of other songs to choose from boasting about the sun and fun to be had in beautiful Myrtle Beach, South Carolina. Movies have been filmed there, cough Magic Mike XXL, it is considered one of the Top Family Beach Vacations in the US and has been a favorite vacation spot of mine, well, all my life!! Can you believe I’ve been going to Myrtle Beach since I was 6 weeks old!! That’s 30+ years of Myrtle Beach trips!! Every summer our family would vacation there and now that I’m older I typically go several times a year. The mini-golf options in Myrtle Beach are endless. With themes ranging from adventures with pirates to fire-breathing dragons, to a jungle safari, to shark attack adventures…wherever your imagination can take you there is a mini-golf course just for you. We’ve played a lot of the “putt-putt” places in Myrtle Beach but Mt. Atlanticus is my fave! This Ripley’s Believe it or Not Museum is located on Ocean Boulevard (also known as the Main Strip) and while it is awesome my personal favorite is the Ripley’s Aquarium located at Broadway at the Beach. It probably has a lot to do with my fascination with sharks but I’m like a little kid in this place! Dive with sharks swim with stingrays, even sleep with the sharks(this is very cool! ), or see a live show. There’s so much to see and do that is really unique in these museums. Each one of these has specialty shops, unique eateries, boozy bars, various attractions, and live entertainment. During the summer they also each have their own unique firework shows! Broadway at the Beach is fun with lot’s of shops and great live music, plenty of places to bar hop and munch on some amazing eats. Jimmy Buffett’s Margaritaville Restaurant is located here which is just too much fun to eat and shop at! The Boardwalk is jammed packed with stuff to see and do along the strip…little beachy shops and longtime favorites like the Gay Dolphin. It’s a two-story souvenir shop that has been on the strip FOREVER. Seafood is such a weakness of mine. I love oysters, mussels, shrimp, calamari, eel…lets just put it this way… if it’s from the ocean I’ll try it…and more than likely I will love it. Myrtle Beach boasts some of the best seafood I’ve ever had. Jimmy Buffett’s Landshark Restaurant is a great one for a beautiful view while dining. But my ultimate must-go-to every time I am in Myrtle Beach is the Flying Fish Market located at Barefoot Landing. As you can see in the picture above, they don’t hold back on portions. This dish was the Build Your Own Boil which starts with a base of corn on the cob, red skinned potatoes, and pecan smoked sausage. You then select from 1¼ lb Snow Crab legs (2 clusters, ½ lb Gulf Shrimp, 1 Dozen Littleneck Clams, 1 lb PEI Mussels, or 1 Dozen Oysters. I am an oyster fanatic so I chose the oysters and mussels, but I tried several things off their menu and everything has been ridiculously good!! (Update 4/16/18) We recently took a day trip to Myrtle Beach just to eat at Flying Fish Market. We did stop at the beach and snapped a few pics but I wanted some dang good seafood…and dang good seafood is exactly what I got!! Now if you’re looking for amazing seafood on a po’woman’s budget(like me half the time) try the Original Shucker’s Raw Oyster Bar. They have 2 locations to choose from in Myrtle Beach and the Happy Hour Specials are the best in the area!! This is the biggest must, you must do in Myrtle Beach!! , and head to the beach. …or just lay back, put your toes in the sand and relax. Hit up a local favorite like the 2nd Avenue Pier for some shark fishing, arcade games, beach rentals, and fantastic views of the coast!! Do whatever makes you happy while you take in the beautiful views of the stunning Myrtle Beach coastline. I had to mention the Sky Wheel! Amazing views day or night, and not a bad price either. It’s $9 for children ages 3-11 and $14 for ages 12+. *Prices subject to change. If you haven’t done this before you should at least ride once!! Bonus if your 21+: Grab a Drink! Get your drink on!! You’re on vacation! Wet Willies located at Broadway at the Beach. They serve tons of flavors of frozen daiquiri!! And they let you sample different flavors while you decide which one is perfect for you. I had the “Call a Cab”… I’m lucky I wasn’t driving or I would have needed to call a cab!! They are absolutely delicious…and dangerous!!! And another favorite of mine on the Myrtle Beach Boardwalk is Dirty Dons…and the Bowery has the cheapest beer on the strip…and it’s frosty cold! There is amazing history all around this coastline town…be sure to ask the locals to tell you some stories! I’ve heard a few tales! 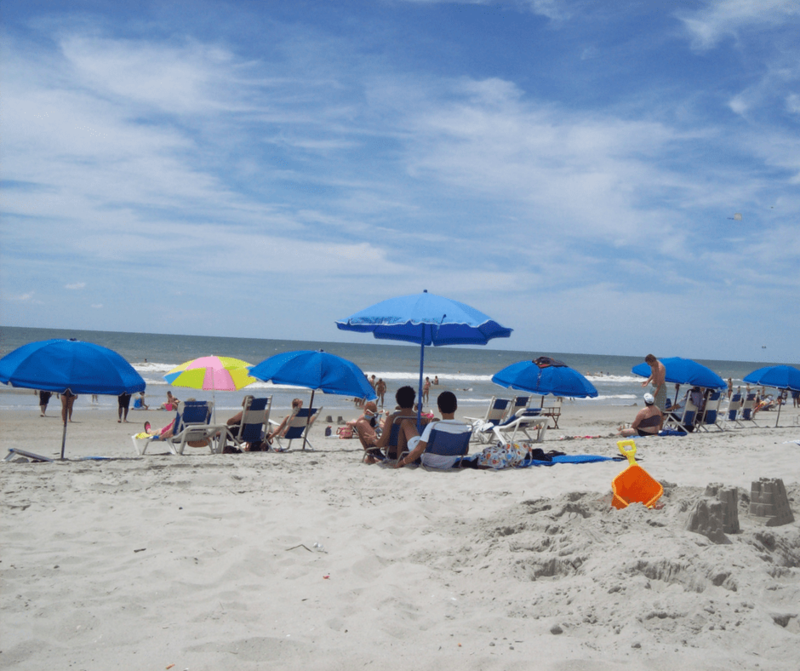 What is your favorite thing to do while visiting Myrtle Beach, SC?